When Rivers Were Trails is an educational 2D adventure game (PC, Mac, Android, iPad) which follows an Anishinaabeg in the 1890’s who is displaced from Fond du Lac in Minnesota and travels to California due to the impact of allotment acts on Indigenous communities. Developed in collaboration with the Indian Land Tenure Foundation and Michigan State University’s Games for Entertainment and Learning Lab as a component to Lessons of Our Land with art by Weshoyot Alvitre and music by Supaman. Dialect is a story game where players participate in an isolated community whose language emerges and must be protected from loss as they establish values, interact, and face challenges through modular world-building. Designed by Thorny Games with writing by Elizabeth LaPensée. In the 2D sidescroller Thunderbird Strike, fly from the Tar Sands to the Great Lakes as a thunderbird protecting Turtle Island with searing lightning against the snake that threatens to swallow the lands and waters whole. With design, art, and writing by Elizabeth LaPensée, programming by Adrian Cheater and Aubrey Jane Scott, and music and sound effects by NÀHGĄ a.k.a. Casey Koyczan. Awarded Best Digital Media at imagineNATIVE Film + Media Arts Festival 2017. Awarded Runner-Up at EarthGames on Tap 2018. Exhibited at “Thunderbird Strike: Art and Arcade” at Western Arctic Moving Pictures, and “The Environmental Justice and Decolonization” Game Curious Series. Where the Water Tastes Like Wine is a bleak American folk tale about traveling, sharing stories, and surviving manifest destiny. Designed by Johnnemann Nordhagen and developed by Dim Bulb Games and Serenity Forge with writing by Elizabeth LaPensée and more. Awarded Developer Choice at IndieCade 2017. Coyote Quest is a point-and-click adventure game for the web based on Coyote's Crazy Smart Science Show on Aboriginal Peoples Television Network that engages in Indigenous science through Coyote's tricky style. With creative direction by Loretta Todd, narrative design and writing by Elizabeth LaPensée, art by Nelson Dedos Garcia, music by Mob Bounce, design and programming by Silverstring Media, and production by Agentic Digital Media. Exhibited at imagineNATIVE Film + Media Arts Festival 2018. Inspired by traditional moccasin game, Mikan is a finding game on mobile (Android and iOS) created for the Duluth Children's Museum with design and art by Elizabeth LaPensée, programming by Tyler Coleman, and sound by Jon Whiting that passes on phrases such as jiimaan (canoe) in Anishinaabemowin. Honour Water is a singing game for mobile (iOS) developed by Pinnguaq with art and design by Elizabeth LaPensée. Songs by Anishinaabe elders and Sharon Day sung by the Oshkii Giizhik Singers pass on teachings about water in Anishinaabemowin. Exhibited at imagineNATIVE Film + Media Arts Festival 2016, Water Moves MSU, Frozen River Film Festival 2016, and Asinabka Festival 2017. Little Earth Strong is a gameful health intervention program where youth are superheroes who activate gifts based on the Seven Teachings by completing powerup challenges. Elizabeth LaPensée designed and created art for the gameful program in partnership with the Research for Indigenous Community Health Center and Little Earth United Tribes. Singuistics: Anishinaabemowin is a singing game for mobile (iOS) which passes on language featuring singing by the Miskwaasining Nagamojig with design by Pinnguaq and art by Elizabeth LaPensée, Shaun Hedican, Simone McLeod, and more. With design and programming by Elizabeth LaPensée, art by Steven Paul Judd, and music by Trevino Brings Plenty, Invaders for web and mobile is a spin on the classic arcade game Space Invaders. Curated by Babycastles, SAW Gallery, and Bloodlines at Bridge Productions. Shown at imagineNATIVE Film + Media Arts Festival 2015, Indie Revolution Expo 2016, and Digital Games Research Association + Foundations of Digital Games Conference 2016. Ninagamomin ji-nanaandawi'iwe (We Sing for Healing) is a musical choose-your-own adventure text game for web with design, art, and programming by Elizabeth LaPensée and music by Exquisite Ghost. Shown at imagineNATIVE Film + Media Arts Festival 2015. Curated by Planet IndigenUS 2015 and SAW Gallery. The Gift of Food is a board game about traditional Northwest Native foods by the Northwest Indian College. Designed and written by Elizabeth LaPensée and produced and co-written by Elise Krohn with art by Roger Fernandes and graphic design by Annie Brulé, this delightful game is packed with traditional food knowledge. Each player balances foods and medicines in their basket while reinforcing the values of collaboration, stewardship, generosity, and gratitude as they strive to thrive through the seasons. Gathering Native Foods is a suite of touchscreen mini-games co-designed by Elizabeth LaPensée in collaboration with the Hibulb Cultural Center and Natural History Preserve on behalf of Tulalip tribes and Oregon Museum of Science and Industry. Mini-games include clam digging, wild blackberry picking, and salmon catching in ways that honor land and community available in museums through a national tour of Roots of Wisdom: Native Knowledge, Shared Science. In the social impact game Max's Adventures designed and written by Elizabeth LaPensée, Max the Fox and his friends engage youth in wellbeing through being active, eating healthy meals and snacks, and balancing with water while they complete quests that take place in nature and online. Mawisowin is an arcade style web game for the Aboriginal Peoples Television Network show Back in the Day. With conceptual design by Elizabeth LaPensée and design and programming by Ed Stastny, this fast paced game is a race to pick berries and clear diseases on bushes before they wilt. Survivance is a social impact game designed by Elizabeth LaPensée that asks us to explore our presence and create works of art as a pathway to healing. Shown at imagineNATIVE Film + Media Arts Festival 2013 and Nominated at IndieCade 2016. Featured in "Games Can Preserve Indigenous Stories and Oral Histories." Techno Medicine Wheel, designed and written by Elizabeth LaPensée in collaboration with T’Uty’Tanat-Cease Wyss, is an alternate reality game from the Aboriginal History Media Arts Lab. Little People lead players on adventures throughout traditional territories in Vancouver, British Columbia as they learn about traditional medicinal plants and their care and uses. Venture Arctic is an eco sim from award-winning indie game company Pocketwatch Games with writing and cultural research by Elizabeth LaPensée that challenges the player to act as Mother Nature, acknowledging the impact of oil industry on the life far north in the midst of growth in the sun and destruction in the wind. "Of Ash and Snow" in the forthcoming Sovereign Traces Volume 2: Relational Constellation (MSU Press and Native Realities Press) with writing and colors by Elizabeth LaPensée and inks by Mitchell Bercier is a romance about Métis who cross paths during the peak and collapse of logging industry in the early 1900's. Written by Louise Erdrich with art by Elizabeth LaPensée, "The Strange People" in the comics collection Sovereign Traces Volume 1: Not (Just) An(Other) (MSU Press) follows an antelope woman whose night goes as to be expected for her people. Written by Elizabeth LaPensée with art by Richard Pace, "They Who Walk As Lightning" in MOONSHOT: The Indigenous Comics Collection Volume 2 (AH Comics) highlights a young woman who returns to thunderbird teachings as she works alongside her family to face the impact of toxic spills in their community. Bronze Medal for "Best Graphic Novel - Drama" at the 2018 Independent Publisher's Awards. "Best Anthology" at the 2018 Joe Shuster Awards. Deer Woman: A Vignette, which later grew into Deer Woman: An Anthology (Native Realities Press 2017), tells Deer Woman's side of the story while passing on self-defense teachings in support of Arming Sisters. Written by Elizabeth LaPensée, edited by Allie Vasquez, and illustrated by Jonathan Thunder. Awesome Foundation Portland's Peoples' Choice Award. Written by Elizabeth LaPensée for MOONSHOT: The Indigenous Comics Collection (AH Comics) with art by GMB Chomichuk, "The Observing" retells a historical story of an unexpected encounter while hunting. Bronze Medal for “Best Graphic Novel” at the 20th Annual Independent Publisher’s Awards. Named "The Best Book of 2015" by the School Library Journal. 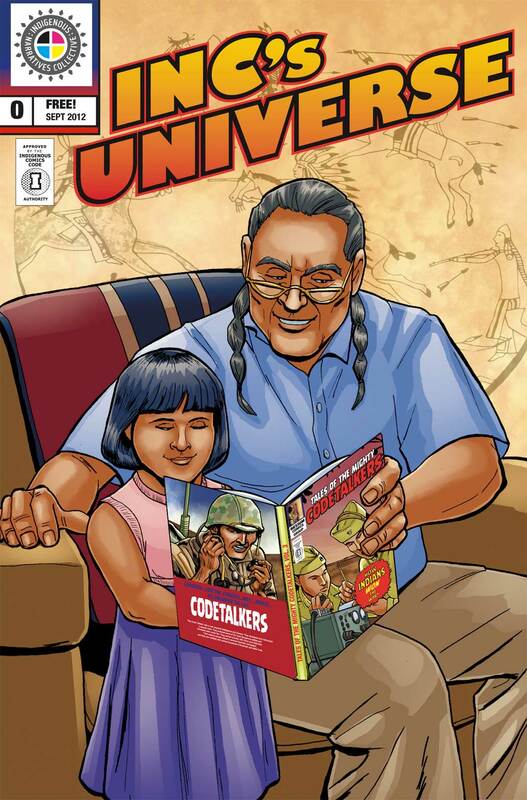 Written by Elizabeth LaPensée for MOONSHOT: The Indigenous Comics Collection (AH Comics) with pencils by Claude St-Aubin and color by Andy Stanleigh, "Copper Heart" reflects on a man's childhood experience with the memegwesiwag who come to the aid of his sister when she falls ill. Bronze Medal for “Best Graphic Novel” at the 20th Annual Independent Publisher’s Awards. Named "The Best Book of 2015" by the School Library Journal. With art and writing by Elizabeth LaPensée, Our Words in INC's Universe #0 is a one-page comic which reflects on the burning of birchbark scrolls and recognizes comics as a way to share stories and teachings. The Nature of Snakes is a reimagined traditional story told through writing and art by Elizabeth LaPensée and Anishinaabemowin translations by Perry Bebamash. Premiered at imagineNATIVE Film + Media Arts Festival 2012. Fala is an urban Native remix of Alice in Wonderland in web comic form written by Elizabeth LaPensée which was created through winning the Aboriginal Peoples Television Network's Comic Creation Nation Contest. The West Was Lost is a steampunk web comic written by Elizabeth LaPensée which was created through winning the Aboriginal Peoples Television Network's Comic Creation Nation Contest. Shown at imagineNATIVE Film + Media Arts Festival 2010. Along the River of Spacetime is a virtual reality game about activating Anishinaabe knowledge to restore eco-systems with art, design, and writing by Elizabeth LaPensée. Made possible by the Guggenheim Foundation Fellowship 2018. Thunderbird Strike passes on stories about a snake that threatens to swallow the lands and waters whole through a stop motion animation, 2D game, comic, and social impact game by Elizabeth LaPensée. Manoominike is a motion responsive interactive experience within a wigwam structure which shares Anishinaabe practices of ricing. It was created for the Duluth Children's Museum in collaboration with Ojibwemowining Digital Arts Studio with design and art by Elizabeth LaPensée, technical direction and video art by Joellyn Rock, and programming by Logan Sales. A First Nations teen resistantly steps up against Wetiko to protect the community at Gods' Lake from urban expansion and destruction in the Aboriginal Peoples Television Network's Animism, an animated series, alternate reality game, and short story anthology with writing by Elizabeth LaPensée. Shaw Rocket Prize Finalist 2013.